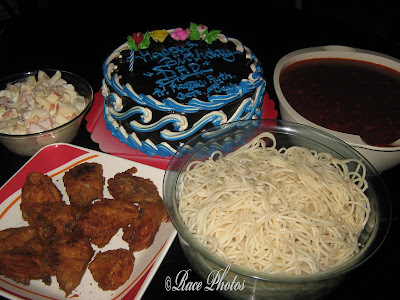 My Crossroads: :Food Friday - Hubby's Birthday Food! :Food Friday - Hubby's Birthday Food! Today is dear husband's birthday and these are his birthday foods. We celebrated it in advance yesterday as he filed a leave of absence yesterday for a one-day vacation rest in Tagaytay. We didn't go on with the plan of going to highlands of Tagaytay but we spent the day together in the house and decided to cook and celebrate his birthday yesterday. We went to the mall in the morning with Josh as he's on an early morning school schedule and bought some food and electrical supplies for the house. 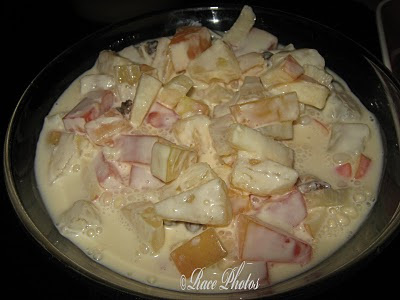 Later in the afternoon I cooked pasta and chicken, made some delightful fruit salad and ordered cake. My girls were surprised at the advance celebration when they arrived but were happy with it. They were expecting that we're still in Tagaytay. Well everything happens on purpose, maybe on our next plan my young girls will have no exams and they will able to come with us. ps. sensya na, just 'published' the comments earlier today kaya di mo nakita ung previous comment that you made at my blog.